A portrait does not merely record someone's features, however, but says something about who he or she is, offering a vivid sense of a real person's presence. I could not have said it better. Jean was writing about the portraiture of the late 1500's/early 1600's. For the most part, the only people to get a portrait made of them were some those of royalty, or high noblility. I wanted to pursue a series of portraits that had this same feel as the beautiful paintings of the Golden Age. Adam and Jon both have an air about them that makes it easy to think they could have been lords of the realm in years gone by. Me standing next to my beautiful friends and subjects, Adam LIvermore and Jon Lieckfelt. They are each holding their portraits. (L): Adam Livermore, 24"x24" on Black Aluminum. (R): Jon Lieckfelt, 30"x40" on Black Aluminum. Adam and Jon getting ready...as shot from inside the camera. Jon Lieckfelt, 24"x24" on Black Aluminum. Jon Lieckfelt, on Black Aluminum. Adam Livermore, 24"x24" on Black Aluminum. This is the camera that I created for this project. At 10'x10', it serves as both the darkroom and the camera, with a 36" 917mm Aerial lens from WWII. At the end of the shoot Adam and Jon had an idea that they wanted to do. Back in the late 1800's it would have been SCANDALOUS for two men to be holding hands in a photo together. There are some period tintypes that show this was done, but they are very rare. Back then, being gay was not as well accepted as it is now. Sadly, even today, in this and other countries LGBTs are still fighting for equal rights. So here we are, more than a century later, doing what we can to change things. Adam and Jon, 8"x10" on Black Aluminum. Huge shout out to Rico Elvina! Without his help, this wouldn't have been possible. 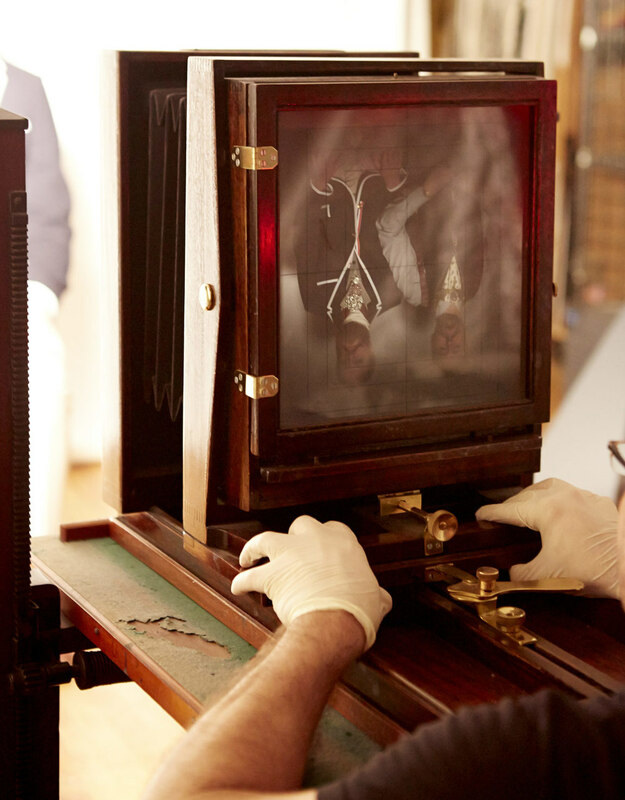 Wet plate at this size is not a one man sport...it takes a village. Thanks, Rico!